I like quinoa. A lot. It has a very slight crunch, and I like the little spiral in each of the grains, which is the translucent germ that appears once cooked. Quinoa is good with other proteins, like salmon or chicken, and also good in things like pancakes or muffins. You can use a stock or broth, or just plain water to hydrate it. Quinoa is high in protein, healthy, and filling. It’s also an amazingly mispronounced word, to my great delight, hence this commercial. I think the first time I ever had quinoa, it was made by my Mum, and it was probably this very dish. It’s crunchy, it’s earthy, and with the tomatoes and lemon, it’s acidic. Between Mum, Sister, and me, we could out-tart anyone on any given day. We like our citrus. 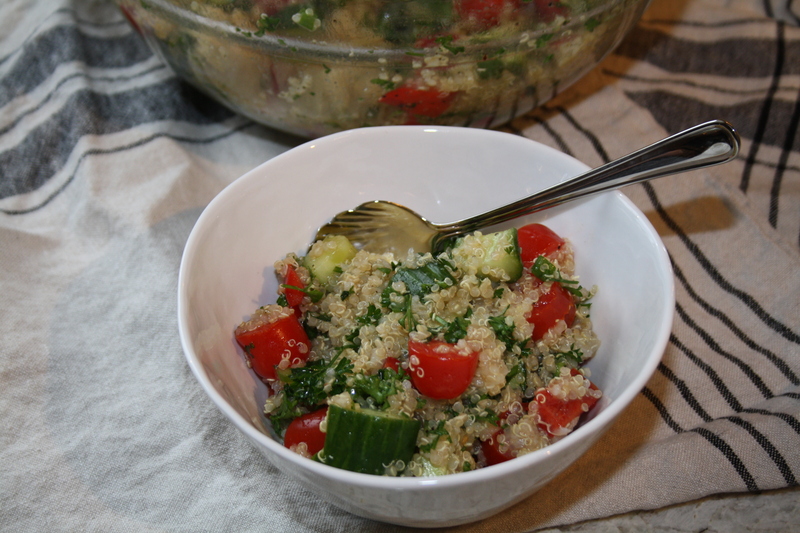 Most recipes I’ve seen for traditional tabbouleh, or quinoa tabbouleh like this one, call for one or two mini cucumbers, finely diced. I prefer chunky diced veg, and lots of it. I used two medium-ish cucumbers because they’re my favourite bite in the finished product. 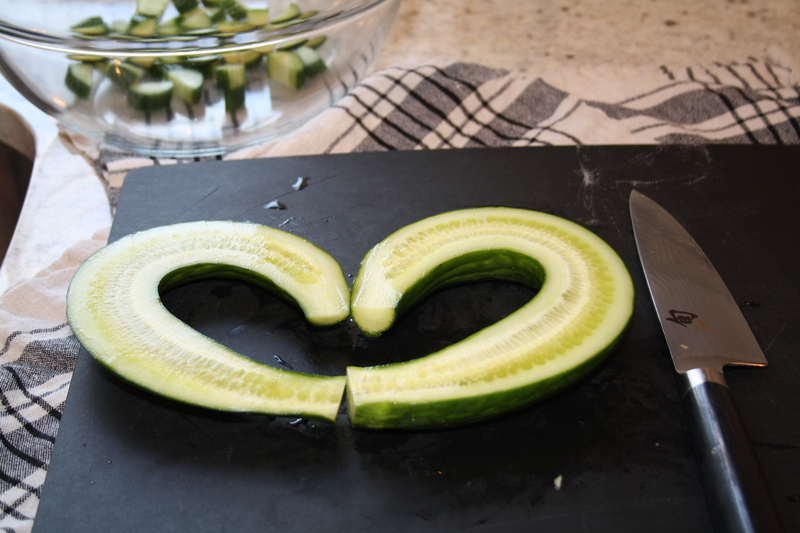 Plus – how could you resist buying, or eating, misfit cucumbers like these? You can’t, I’ve decided. In the summer, when tomatoes are legitimately in season in Canada, I really love using black zebra tomatoes in this salad. The outer skin is tough, which is lovely contrast to their juicy centre. They’re great for snacking too, but hold up great to dishes like these. Since it’s almost December, I’m using imported San Marzano tomatoes – equally flavourful and great for office snacking if that’s what you’re in to. Where Marcus and I live, there’s a Lebanese place down the road. They do za’atar flatbread, and fattoush, and spinach and feta pies, and donair of course. They also make a traditional tabbouleh that’s excellent. It’s heavy on parsley, essentially substituting parsley for what Westerners would use lettuce for, with very finely chopped tomato, garlic, and cucumber. 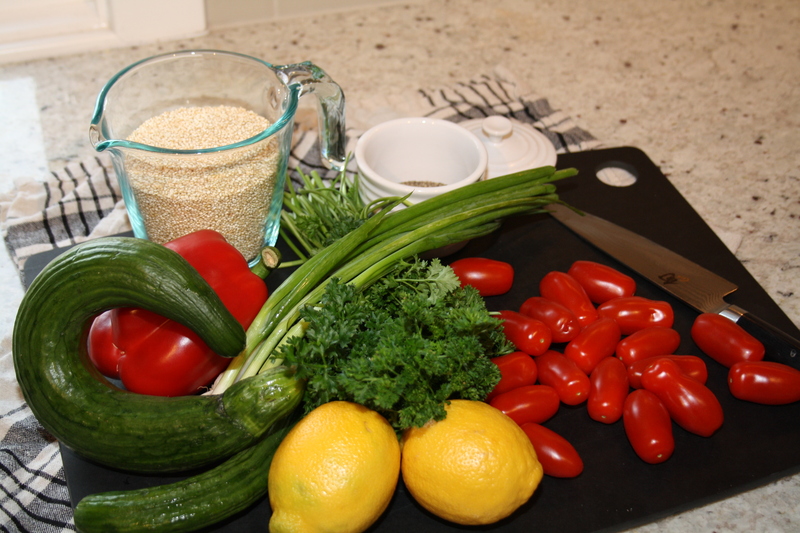 Barley or couscous is involved, and lemon – always lemon. 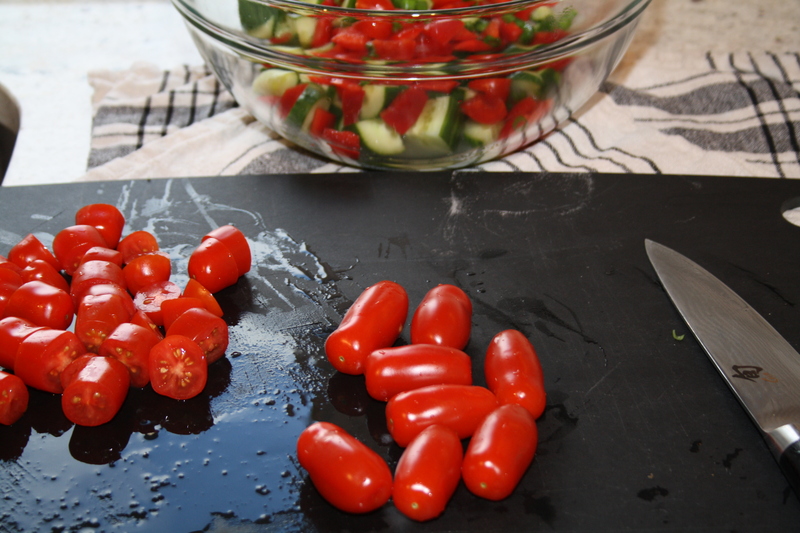 When paired with something doughy or marinated, the sharp freshness of the salad is perfect. Most recipes (or people…) will tell you to cool the quinoa before adding it to the veg and herbs. I am, frankly, far too lazy busy to wait that long, and add my warm quinoa right into the bowl with the rest of the mixin’s. The heat absorbs more olive oil, lemon, and juices, and I let the whole thing come to room temperature before I either serve or refrigerate for later. This recipe is forgiving. Like less parsley? Go for it. More pepper, or tomato, or herb? It will be excellent. I don’t like peppers, but put them in anyways since Marcus does. Easily picked out. Fresh mint is essential, and the best, in this salad. I forgot to buy this at the store, so substituted a teaspoon or two of dried mint, which worked just fine. This recipe makes a lot, which is appreciated because it keeps so well and makes for excellent leftovers. When I lived up north I remember making a batch of this on the weekend, and bringing it to work for an afternoon snack or lunch accompaniment. I do the same now, and it’s an easy and perfect make-ahead bite. 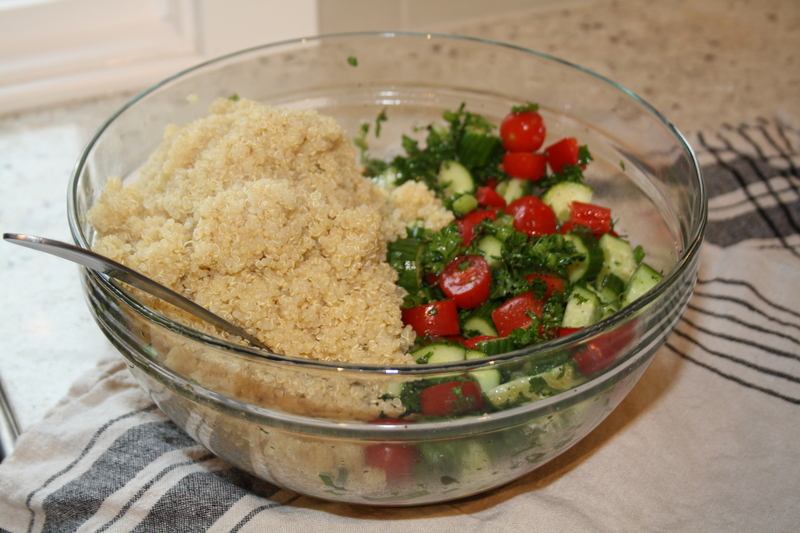 While the quinoa is cooking, dice your veggies and herbs and add to a large bowl. Add the lemon juice, olive oil, salt, and pepper and give it a good stir. When the quinoa is done, let it cool for 5 minutes, then add the quinoa to the bowl of veg and stir to combine. 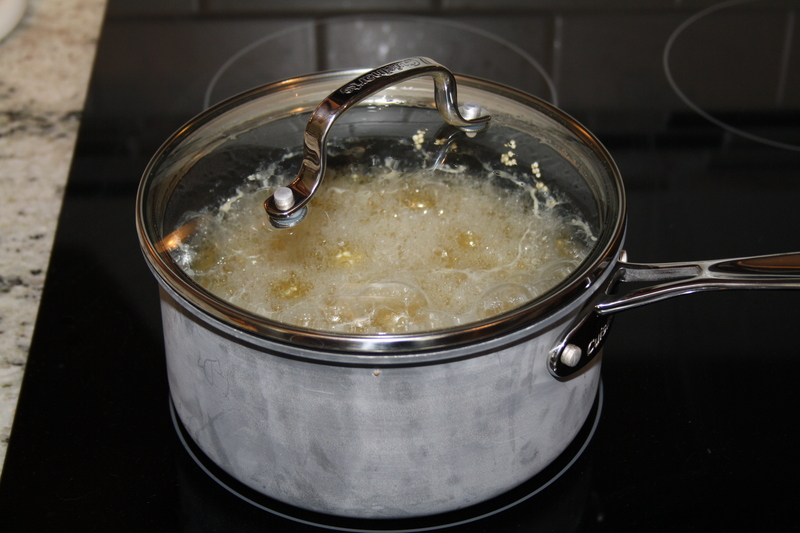 Taste, and adjust seasoning as needed, or add a swirl more of olive oil if it seems dry. Serve at room temperature or chilled from the refrigerator.